I really don’t know what to say about this building 🙂 Art is art and it’s all beautiful ! Incredible! Do you know what’s inside? Is it actually someone’s home? I found out that it’s the back of an art studio Elina 🙂 Around the other side it’s a regular store front. Now this is the type of house I’ve been looking for. I would love it, and would welcome anyone into my home who had the nerve to knock! I could just see the caricature of you in one of the windows now Emilio 🙂 It would go perfectly. A ton age , tu dessine encore sur les murs , tu es resté un grand enfant …!!! Wow! Interesting people must live here. And it looks like there is a barn or another house painted up the same way behind this front one. Thank you Angeline 🙂 I should have taken a separate image of the other building also. Great find. There are so many talented artists out there. It looks fun and silly and we need more of that in a starched world. 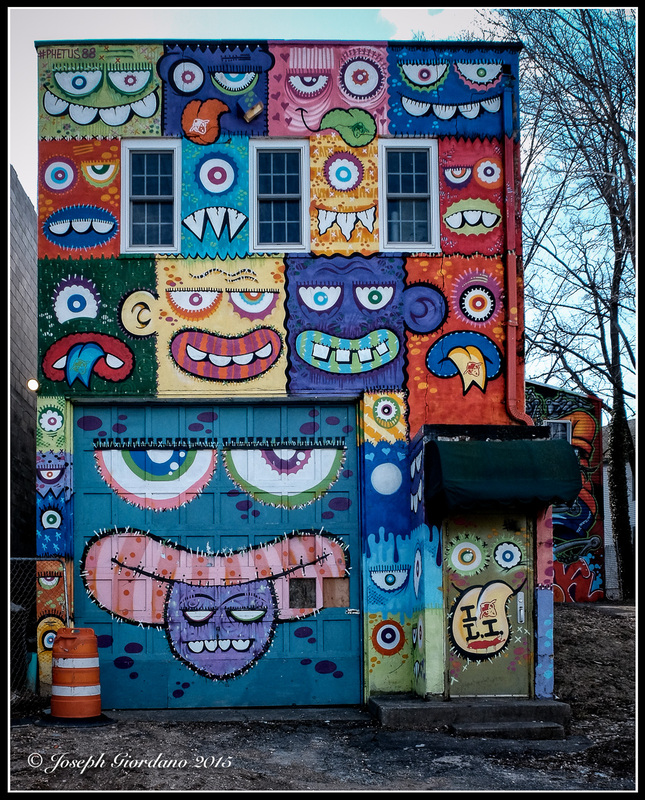 Love the execution of this work and it certainly brightens up the neighborhood! I love the creativity though! OMG, I would who would be “artful” enough to live in house like this. They must have a big sense of humor. Great shot. I loved it. LOL, I love it. Thanks for capturing, Joe, this put a smile on my face. i’d be nosey to see the people inside this “funnyhouse”!